Dinner service at table 442 was great. Room attendant benny was a 10! It's great ship with an exceptional captain and crew! New Zealand is a clean and beautiful place to visit! Beautiful itinerary. We had a great time catching up with friends from previous cruise. It was a very good cruise. The extra day at sea after Tauranga is absolutely NOT NECESSARY. Being in New Zealand for 10 days it would have been nice to invite a local Maori show on board. This was our first cruise with Royal Carribean and will certainly be our first choice for future cruises. They did an excellent job in all areas of the cruise. The Entertainment and Cruise directors did an excellent job in making the cruise a really fun experience. Their daily show on the cabin TVs talking about the upcoming activities for the day was really helpful. The Neil Diamond show starring the cruise director was excellent. Hope they make this show a regular part of the entertainment shows. 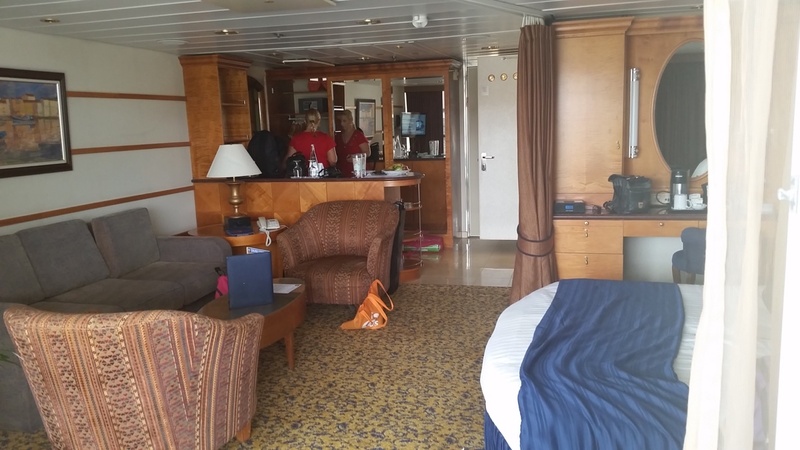 The condition of the ship’s public areas and our balcony cabin was spotless. So impressed by the general condition of the ship. Other outstanding part of the cruise was how friendly and helpful all the cruise staff was in the cabin areas, open bars, the speciality restaurants, and the main dining room. Our table waiters for the main dining room were outstanding. They anticipated our every need and were so fun with their short stories every dining night. Also loved the “towel animals” we had waiting for us on our bed at the end of the day. Very impressed with the efficiency and professionalism of the embarcation and disembarcation processes. Only suggestion would be that two days be spent on Kauai, and eliminate Kona as a stop. Just not that much to experience at Kona. One other thing that would be nice to have on the first day of the cruise would be an introduction to the ship and the facilities as well as a tour of the public areas and main and optional dining areas by the cruise director, similar to the daily compass activities show. Radiance has a wonderful personality with very helpful and friendly staff. The on board activities are typical for a smaller ship. If the Activity Director, John Blair, performs his salute to Neil Diamond be sure to see this! We ate every dinner in the main dining room because the food and service was excellent. Will definitely cruise on this ship again! All in all, a nice cruise -- had decent weather, and enjoyed the beautiful sights. The onboard staff was amazing ... and they made a suitable big fuss over my spouse's birthday. Do be prepared for the 18% "gratuity" that is automatically added to your bill ... since the staff was so good, we did not dispute it, but plan on it adding about $30/day to your cost of the cruise (for 2 sharing a cabin). Our waiters in the dining room were fantastic!!! Angelo & Iwayne were very friendly & took care of us wonderfully. Very professional but very accommodating as well. Excellent trip! Had great fun! Met new people and have kept in touch with them! Staff were friendly and helpful! A great experience for us and the friends we took with us on their first cruise! All the ports were great. The side adventures were easy and exciting. The zip line land was incredible! Though we leave in FL, it was our first cruise experience to Alaska. It was awesome and riding with RC - it added the icing on the cake. RC staff was professional and very helpful. Their cooks were excellent and really enjoyed all the menus they served for 7 days. (Only one but very important suggestion- as we were vegetarians, they served Indian bread. It was not at all eatable and bcos of it, we were not able to enjoy most of the Indian gravys. Bread is equally important in food menu and they must get Indian bread instead of doing work around). Otherwise it was one of the best trip we had and we thoroughly enjoyed it. Great cruise. Would use Royal Caribbean again. Well organized. The ship was clean and attractive; the scenery (constantly) was beautiful; the ports of call were excellent (though warmer than we expected); our excursions were interesting. However, we did have a few disappointments: * As soon as we got on the ship, we were accosted by people pushing extra amenities - specialty restaurants, photos, drink specials, etc. This was unprofessional and unacceptable. It made a poor first impression. After paying a great deal for the cruise, it was insulting to be pushed to spend even more on "extras." * The food on the ship was only mediocre. From previous experience, we expected the buffet to be only mediocre, but expected the dining room food to be exceptional. However, it was not. There were less choices on the menu than in the past, and the quality of the food was not what we had experienced in the past. I have a theory about it - with the addition of specialty restaurants (at an additional charge), the quality of the dining room and buffet have diminished. Why would someone pay extra if they were already getting excellence? After paying for a cruise (where unlimited food is provided), I refuse to pay extra for food. * The entertainment on this cruise was also mediocre. The first show by the singers and dancers was very poor. It was hard to tell if the problem was poor performance or poor choreography. It was certainly poor song choices - it was as if they didn't want to pay for royalties for songs we recognized. The show later in the week ("Piano Man") was excellent, however. And the comedian and magician/acrobat were excellent as well. * Some of the games ("Love and Marriage," "The Quest") need to be retired. These same games have been on every ship I've been on for the last three years. It's truly time for something new. Overall, we really enjoyed the cruise. We were amazed at the scenery and the late night sunlight. I don't know if the disappointments were exclusive to Royal Caribbean or if they are industry-wide. I will probably sail another cruise line next time to find out. Best vacation ever! Fun, active, great accommodations and delicious food. Staff was outstanding! Carnival cruise lines is always getting a bad rap, but compared to our recent cruise on RC, I think Carnival wins in my opinion. Our ship was beautiful with nice features and options, but dining options outside of specialty dining was limited in scope and time availability. And the service lacked warmth and feeling. I've never felt less pampered on a cruise. Overall, a good experience. But my first choice for my next cruise is Carnival. Guy's Burger Joint, 24-hour pizza and ice cream, and happier employees. RC needs to step up their game. Wonderful experience! The excursions allowed us to see Alaska's beauty. All of the crew members were friendly and helpful. Had a great time. Staff was over the top friendly and efficient. The entertainment /activities were very good. The daily breakfast/lunch buffet food was very good, but dining room food was average. It appears the cruise lines have changed since our last cruise over ten years ago, moving what used to be great entree's/meals to the upscale dining room options as an additional revenue source. However, in talking with others this is common practice for all cruise lines. Overall, I would recommend this cruise, and I would certainly cruise with Royal Caribbean again. Would take a different ship/line next time. This ship did not have much in the way of entertainment. The comedian was constantly checking his watch so that he didn't go over 45 minutes. It was awkward. Main restaurants had very limited time frames. Charge $7.95 for room service any time of day. Not the shipboard experience I was hoping that my family would enjoy. Some great crew members...some not so great. Food average. Would not recommend for younger travelers. Most programs geared for older crowd. Just pretty boring.